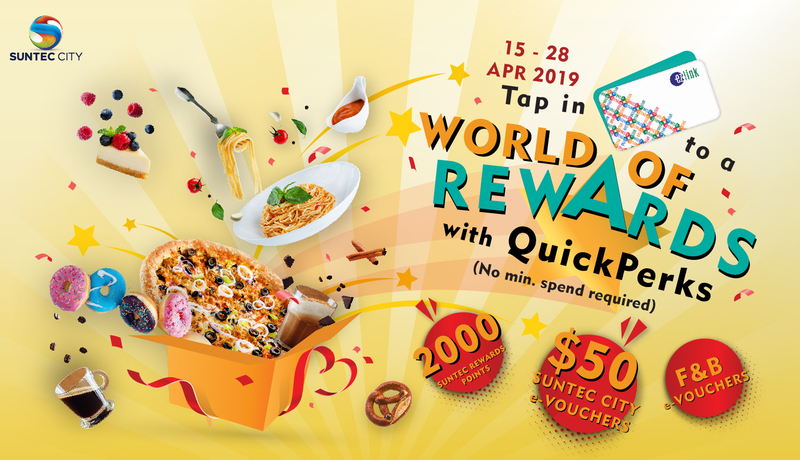 Stand to win up to $50 Suntec City e-voucher when you tap in at Suntec City’s QuickPerks Kiosk with no purchase required! Alight at either Promenade, Esplanade or City Hall MRT station between 15 to 28 Apr 2019 from 12pm to 8pm daily. Tap your ez-link / NETS FlashPay card at any of our QuickPerks Kiosks and follow the instructions to redeem for your FREE reward (No purchase required). A redemption slip will be printed out. Scan the QR code on the slip with your Suntec City App (Under Rewards, go to the “Redeem” tab and press on the QR code icon. The Suntec rewards e-points/e-voucher will be credited into the e-points/e-wallet (under “treats”) respectively. On the 5th tap in, get a chance to “Spin the Wheel” and stand to win up to $50 Suntec City e-voucher. Note: Concession cards and bank issued ez-link and NETS FlashPay cards are not eligible for redemption.